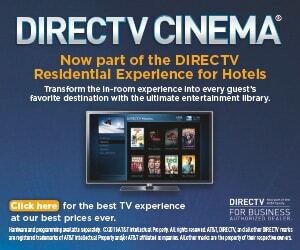 DIRECTV CINEMA Now Available for Hotels! the DIRECTV Residential Experience (DRE) PLUS! Great news! DIRECTV CINEMA has launched! Transform the in-room experience into every guest’s favorite destination with the ultimate entertainment library from DIRECTV CINEMA. DIRECTV CINEMA® enhances your Hotel’s entertainment to a “like home” experience by providing your guests with access to hundreds of the latest movies, many available nearly a month before Netflix® or Redbox®, at residential price points starting at $5.99. DIRECTV CINEMA is available for new and existing DIRECTV Residential Experience (DRE) Plus properties providing the highest viewing experience for guests without taxing the hotel infrastructure. This unique product, utilizing an on-premise video caching server, reduces long-term broadband costs and minimizes Internet congestion from video streaming applications. DIRECTV CINEMA movies stream locally over the hotel wiring infrastructure, not your hotel’s Wi-Fi or broadband network. This allows your hotel to provide a better, faster entertainment on demand viewing experience to your guests – something your competition can’t do! High quality video playback with no buffering! Every hotel knows that guests watching programming from Netflix®, Hulu® and other video streaming services can quickly gobble up bandwidth. Video streaming taxes your hotel’s wifi network for EACH request even if the same streaming video programming is requested by a guest that was previously requested by another guest. DIRECTV CINEMA gives guests access to hundreds of the latest movies while minimizing the utilization of your Wi-Fi network because the programming your guests are watching is cached locally and streamed via your existing wiring infrastructure, not your WiFi or broadband internet. The bottom line is with the DIRECTV Residential Experience Plus and DIRECTV CINEMA you can offer your guests a a better, faster entertainment on demand viewing experience. Something your competition cant offer! logo are trademarks of Netflix, Inc. REDBOX and the REDBOX design are registered trademarks of Redbox Automated Retail, LLC. ©2015 AT&T Intellectual Property. All rights reserved. AT&T, Globe logo and DIRECTV are registered trademarks of AT&T Intellectual Property and/or AT&T affiliated companies. All other marks are the property of their respective owners.